800 yds. 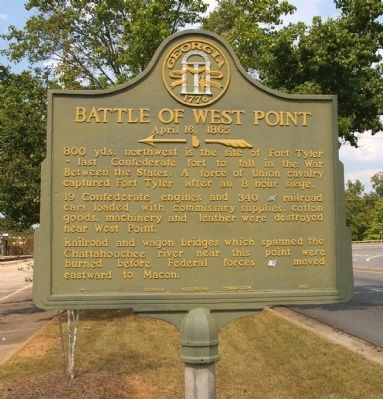 Northwest is the site of Fort Tyler ~ last Confederate fort to fall in the War Between the States. A force of Union cavalry captured Fort Tyler after an 8 hour siege. 19 Confederate engines and 340 [CS] railroad cars loaded with commissary supplies, cotton goods, machinery and leather were destroyed near West Point. Railroad and wagon bridges which spanned the Chattahoochee river near this point were burned before Federal forces [US] moved eastward to Macon. Location. 32° 52.623′ N, 85° 10.962′ W. Marker is in West Point, Georgia, in Troup County. 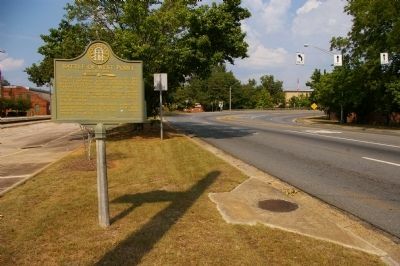 Marker is at the intersection of 2nd Avenue (U.S. 29) and 8th Street, on the right when traveling south on 2nd Avenue. Touch for map. Marker is in this post office area: West Point GA 31833, United States of America. Touch for directions. Looking north on US Highway 29; the road curves east to cross the Chattahoochee River. Fort Tyler (approx. 0.3 miles away); More Enduring Than Marble (approx. 0.3 miles away); a different marker also named Fort Tyler (approx. 0.4 miles away); Fort Tyler Cemetery (approx. half a mile away); Gen. Robert C. Tyler, C.S.A. (approx. half a mile away); Tenth Street School (approx. 0.7 miles away); Bluffton-Lanett, Alabama (approx. 0.8 miles away in Alabama). Touch for a list and map of all markers in West Point. 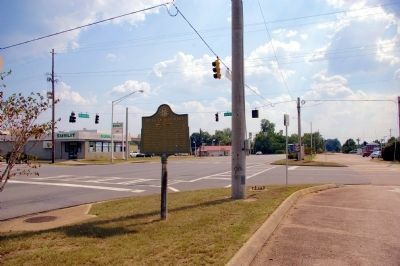 Looking south on US Highway 29 at the intersection with 8th Street and beyond that, the Alabama State Line. More. Search the internet for Battle of West Point. Credits. This page was last revised on June 16, 2016. This page originally submitted on September 21, 2010, by David Seibert of Sandy Springs, Georgia. This page has been viewed 953 times since then and 6 times this year. Last updated on October 13, 2010, by David Seibert of Sandy Springs, Georgia. Photos: 1, 2, 3. submitted on September 21, 2010, by David Seibert of Sandy Springs, Georgia. • Craig Swain was the editor who published this page.